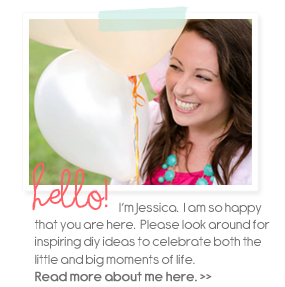 The holidays are fast approaching and the blog world is getting in the spirit of the season! And you are invited to be part of an upcoming event hosted by 12 bloggers to make some holiday mason jar crafts! So in my pumpkin-y mood, I decided to fall up the girls lunch yesterday. A little cookie cutter and some chocolate chips turned their boring peanut butter sandwiches into cute little jack-o-lanterns! Hey pretty people. 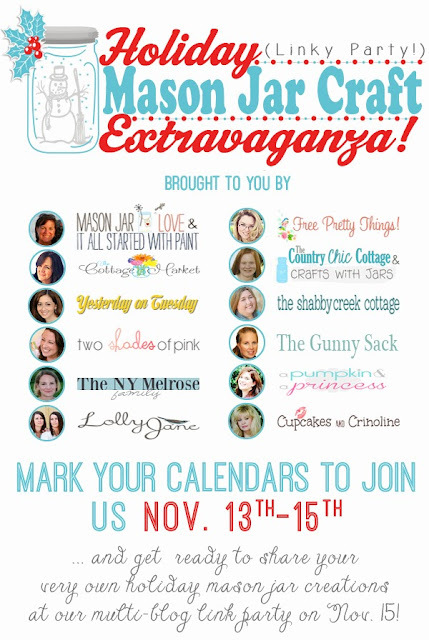 Not sure if you caught this post over at Eighteen25 for their awesome September Spooktacular. 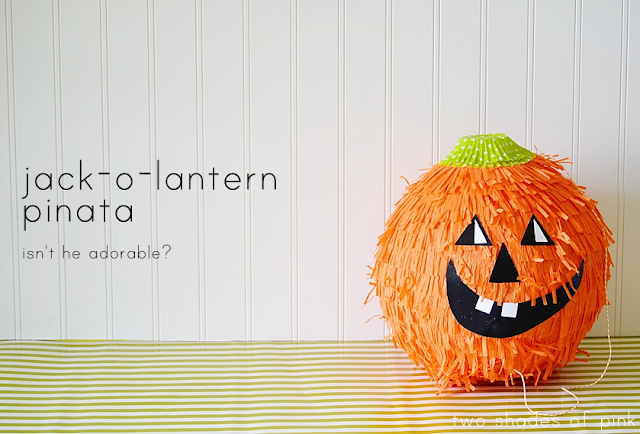 But my project was this adorable Jack-o-lantern Pinata. And guess what? I have never made one before. I have done paper mache and I figured a balloon would work but the rest was me winging it. And I was surprised to find out that it's really easy! You know and I know...we all know...I am not exactly a consistent blogger. But I am really trying hard to fix that and get back on track. But as most of you know....blogging is crazy hard work. So I would love to share things I come across that are absolutely too lovely to share. I hope to share these finds on Fridays. I am not...I REPEAT...I am not committing to a weekly post. I just can't. But when I get the chance, I would love to come here and share some pretty things I find around the web. 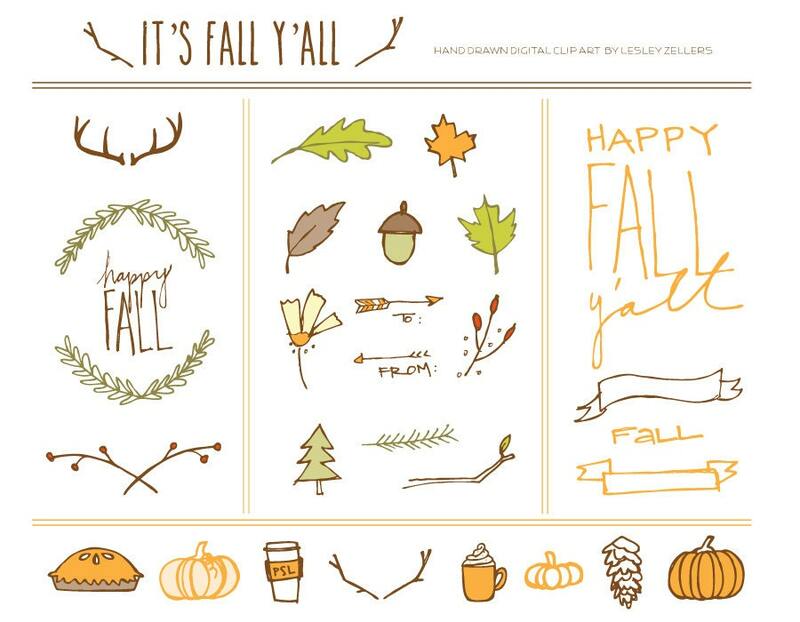 I adore this hand drawn Fall clip art titled "It's Fall Y'all" from Recipe for Crazy. I mean...she even has my beloved PSL! I about died when I saw that. So cute and I love the simple colors and sweet style. Check out the rest of her prints. This one is my other favorite. I'm praying you are not sick of the apple pie thing. I promise today is the last day of all things apple pie. But this one is short, quick, and super cute. I have a thing for putting things in a little kit. It makes ordinary things cute. It's true. So this super easy apple pie kit would make a great teacher or hostess gift this fall. So as promised I told you I would show you my pie. Isn't that the craziest name for a pie? I came across this recipe in a magazine years ago, copied it down and made it because I was so intrigued by the title. You literally bake it inside a paper bag. I tried it and it has become a family favorite. These very words are actually written on my chalkboard above the fireplace. You may ask why this is necessary since this should be obvious...but not to us Floridians melting in the "Fall" humid air. Upper 80's ain't no Fall, you feel me? So this Autumn loving girl "fall's up her house" with leaves, pumpkins and orangey goodness along with the actual message that IT IS INDEED FALL. This is to make up for the summer weather that feels like a guest who won't leave.